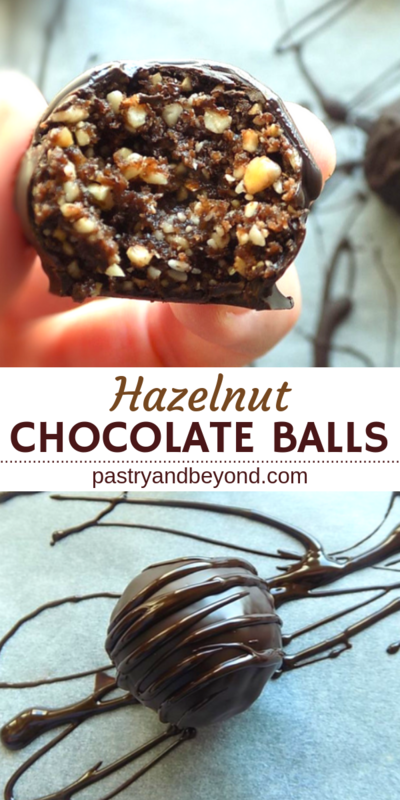 These hazelnut chocolate balls are healthy and delicious! They are so easy to make with only 4 ingredients! 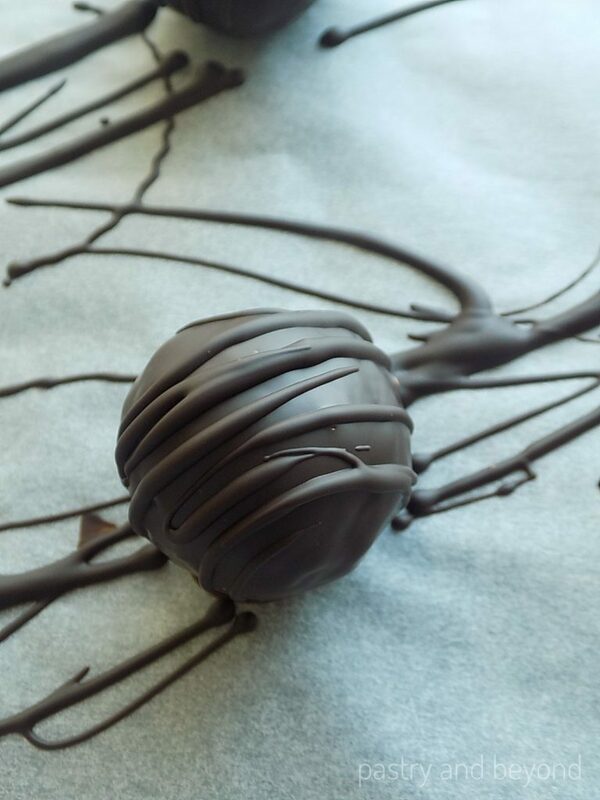 I was thinking of using raisins as a natural sweeter for a long time to make truffles and finally, I did! 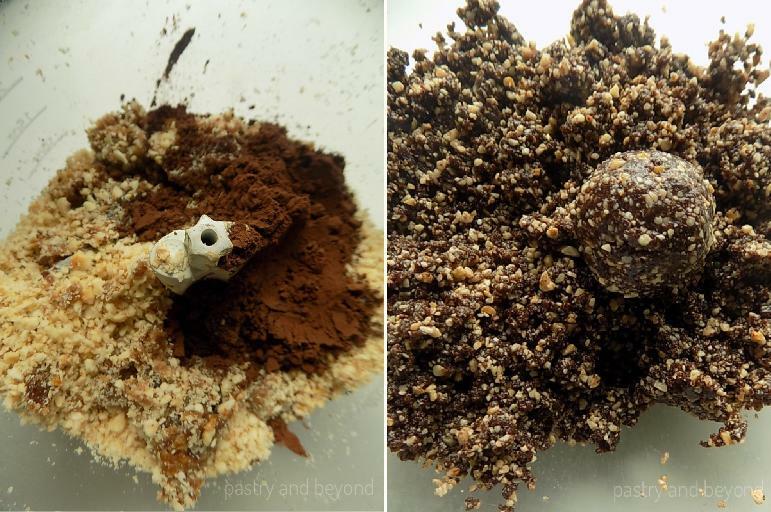 In today’s truffle, I use 4 ingredients: raisins, roasted hazelnuts, cocoa powder and melted chocolate. 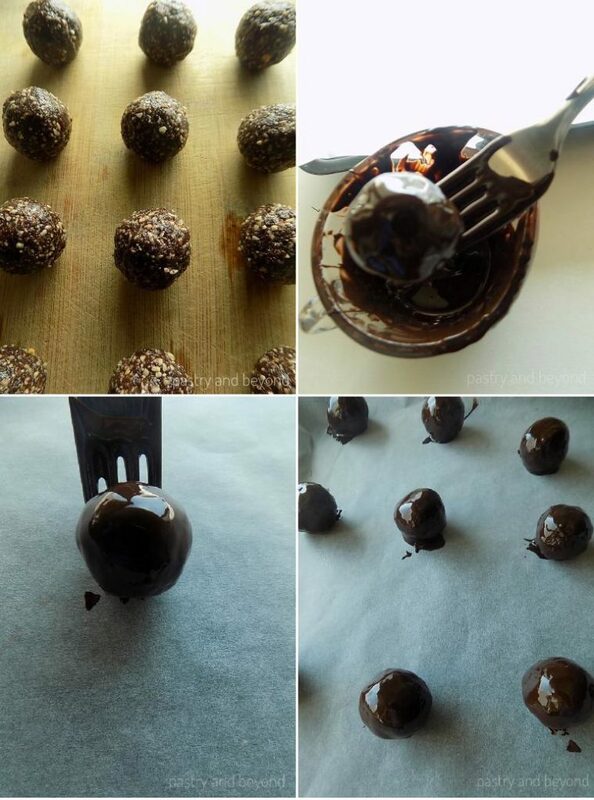 You mix first 3 ingredients together and roll them into balls and dip them into melted chocolate. 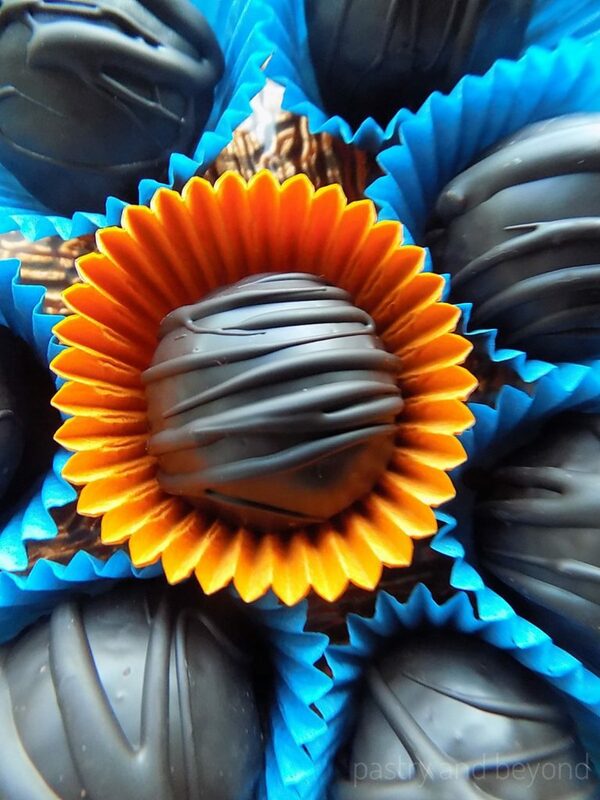 Your healthy and delicious truffles are ready. Raisins give energy, they are rich in iron and good for the eyes. You can read about the nutrition information of raisins here. I use the raisins carefully not too much in my recipe as I dip the balls into the melted chocolate later. If you don’t want to use chocolate, you may think of increasing the raisin amount. First, I place the hazelnuts in a pan and toast over medium heat for almost 3 minutes. I stir in every 15 seconds to prevent them from burning. You can take them from the heat when they give off their aroma. I let them cool on the baking sheet before I put them into the food processor. When the hazelnuts are cool, I place them into the food processor and pulse for 3-4 seconds. 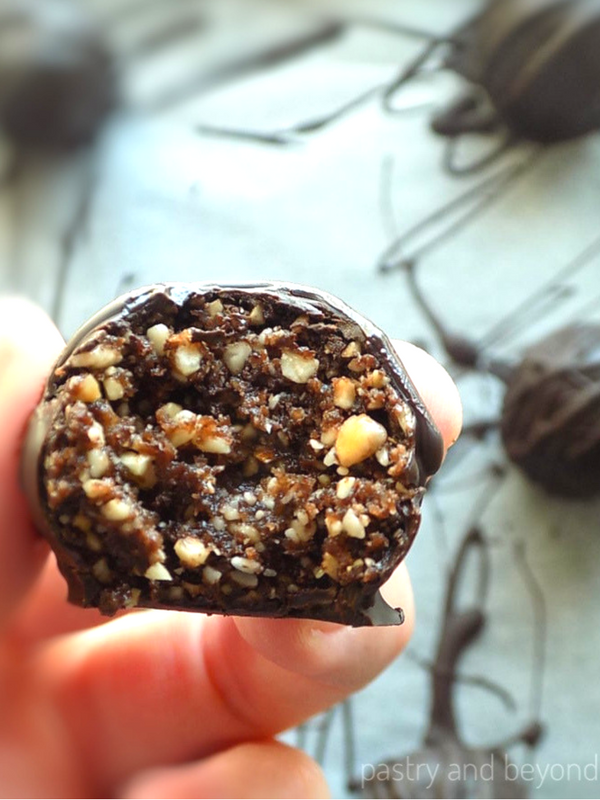 I keep pulsing short as I want big and small hazelnut pieces in my truffles. Then I remove the hazelnuts into a medium bowl. I place the raisins into the food processor and pulse until they are chopped well and turn into a paste. Next, I add the chopped hazelnuts and cocoa powder to the food processor and mix until they form a paste. If you can make a ball out of the mixture, then it is time to stop mixing. I start to roll the dough into small balls (15 grams-almost a tablespoon big). This time I melt the chocolate in the oven at 210°F (100°C). I put the chopped chocolate into an ovenproof dish and begin to stir when the chocolate starts melting. I check the oven regularly to stir as needed. If you want, you can melt the chocolate over bain-marie by placing the chopped chocolate into a heat-proof bowl that sits over a pan of simmering water. Using my fork, I dip the balls into the melted chocolate. Then I let the excess chocolate drip off by gently tapping the fork on the side of the bowl. 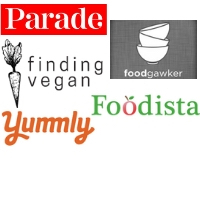 I slowly place the balls on the parchment paper with my fork. I keep them in the fridge for 15 minutes until the chocolate sets. When the chocolate sets, I remove the balls from the fridge and dip my fork into the melted chocolate and drizzle it over the balls. Then I keep in the fridge to let them cool. Finally, I put them into paper cups to serve. Enjoy! If you like this recipe, you may like my mini date nut bars. 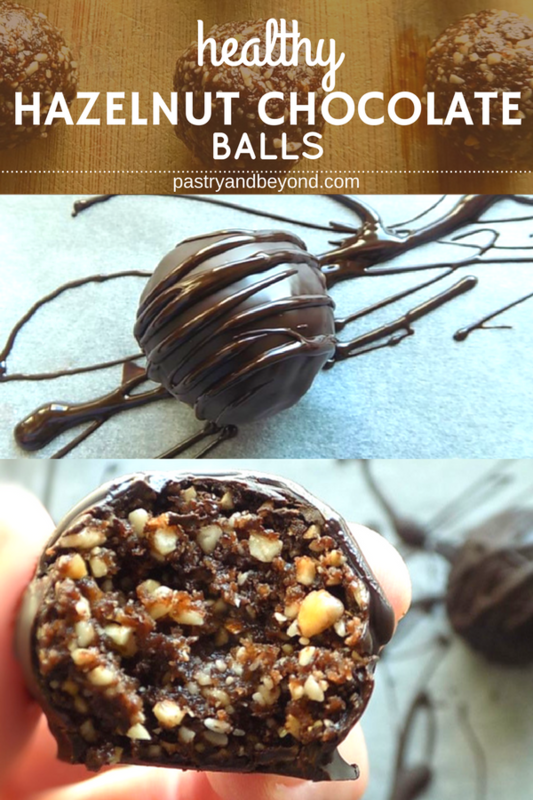 These delicious hazelnut chocolate balls are healthy and so easy to make with only 4 ingredients! Toast the hazelnuts in a pan over medium heat for almost 3 minutes. Stir in every 15-20 seconds to prevent them from burning. Take them from the heat when they give off their aroma. Let them cool on the baking sheet. 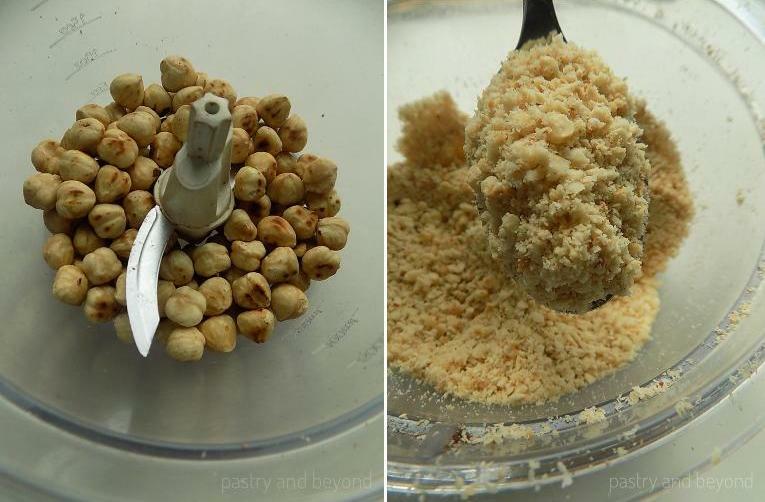 When the hazelnuts are cool, place them into a food processor and pulse for 3-4 seconds to make big and small hazelnut pieces. 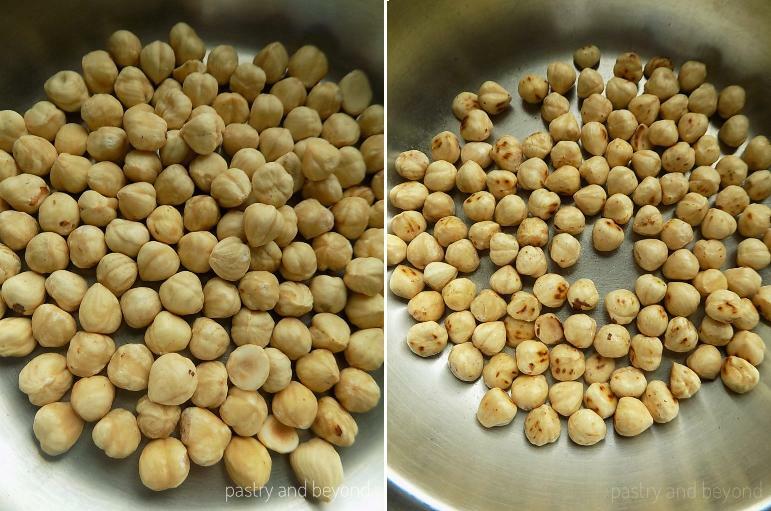 Remove the chopped hazelnuts into a bowl. 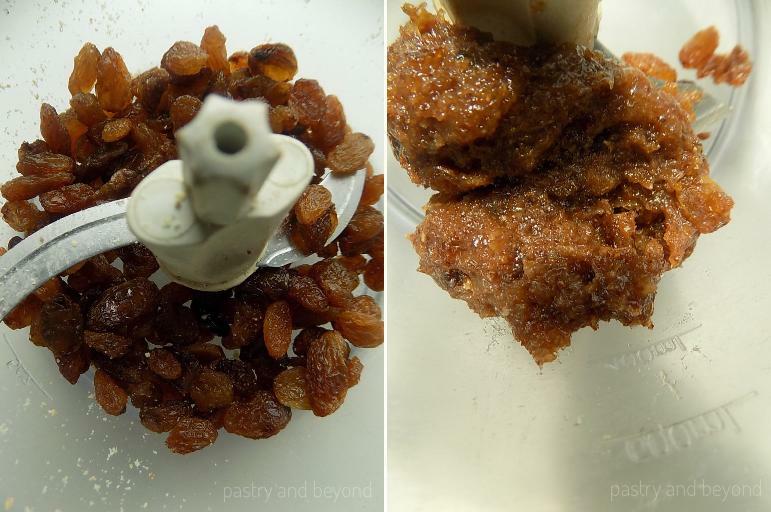 Put the raisins into a food processor and pulse until they turn into a paste. Add the chopped hazelnuts and cocoa powder to the food processor and mix until they form a paste. Roll the dough into small balls (15 grams-almost a tablespoon big). Melt the chocolate over bain-marie: Place the chopped chocolate into a heat proof bowl that sits over a pan of simmering water. Stir often. OR Melt the chocolate in the preheated oven at 210F(100C): Place the chopped chocolate into an ovenproof dish. When the chocolate starts melting, stir the chocolate. Continue melting-stirring as needed. 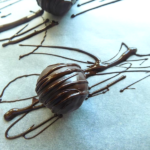 Using a fork or a dipping tool, dip the balls into the melted chocolate. Let the excess chocolate drip off by gently tapping the fork on the side of the bowl. Place the balls gently on the parchment paper with a fork or dipping tool. Keep them in the fridge for 15 minutes or until the chocolate sets. 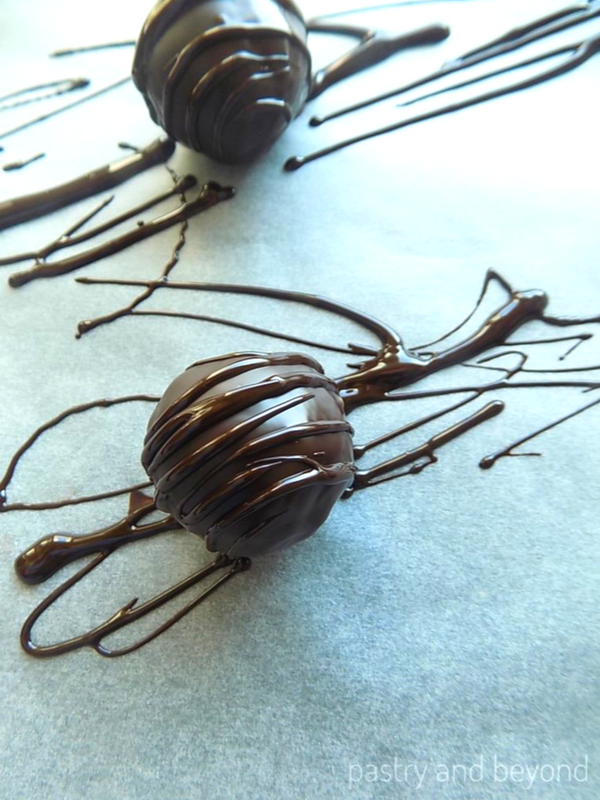 Remove the balls from the fridge and dip a fork into the melted chocolate and drizzle it over the balls.